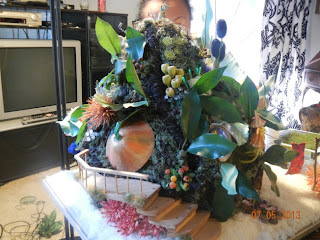 Isn't it amazing. I have my second student. She read about my first student, here on this blog. This is brilliant! I have finished Spring Cleaning my two rooms, my studio and I am now open for business. 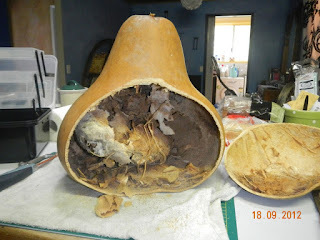 ﻿Bianca choose to start from scratch so she choose a gourd, cleaned it and then used a saw to cut her gourd open revealing the seeds and pith inside. She then needed to cut out the windows. Her next job was to create all the permanate fixtures. 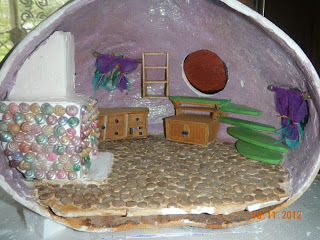 These were a floor, fireplace, three cupboards and shelving and stairs and a clock. She also designed and painted her own stain glass windows. As can be seen from the image to the right the 'bones' of the inside of the house has been placed inside. There is still a 'few' things to do just to finish it off. The inside with the lights switched on. The inside is almost completed. 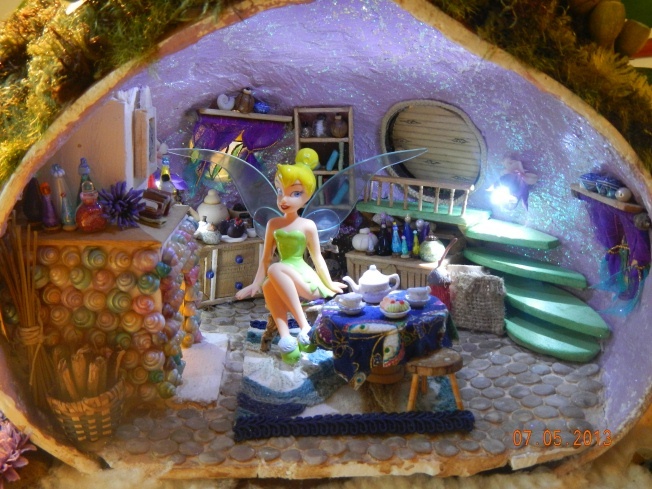 It has three lights and one flickering light in the fireplace and she will be using optic fiber on the outside.﻿﻿﻿﻿ All up it took Bianca 60 hrs to finish her house. She visited me once a week for 3.5 to 4 hrs. The cost of her lessons were $15 hr. The cost of the gourd was $25 and the cost of materials was $20 and lights $25.00. The lights are run on two 9v batteries. After 60 hours of work she made this. Isn't it wonderful!